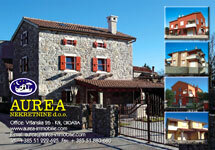 AUREA NEKRETNINE d.o.o., a real estate agency, offers holiday apartments, family homes and building plots. The agency covers the purchase and sale of real estate exclusively on the island of Krk. It should be mentioned that the company enjoys a tradition of over twenty years. It has been successfully operating under the experienced team of professional and kind employees. The result of all the above-mentioned is the trust and satisfaction of their clients, which is confirmed in practice every day. FURTHER DETAILS ARE AVAILABLE AT Aurea Real Estate website.